The USS DEWEY (DDG-45), a Farragut-class guided missile destroyer, was commissioned on 7 DEC 1959. Orginally built as a Guided Missile Destroyer Leader (DLG-15) at the Bath Iron Works, USS DEWEY was commissioned with COMMANDER Elmo R. Zumwalt, Jr., the future chief of Naval Operations, in command. She joined the Atlantic Fleet, in 1960. Homeported successively at Norfolk, Va, Newport, R.I, Charleston, S.C. and Mayport, Florida, DEWEY deployed the the Northern Atlantic, Mediterranean, Far East and Caribbean, always living up to her motto, "The First and Finest". 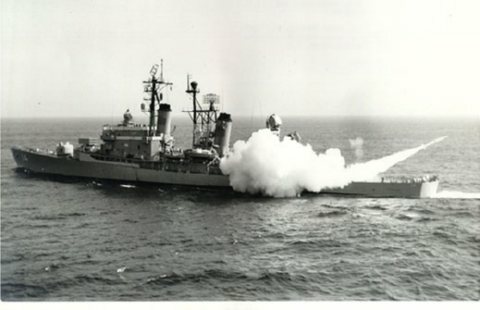 USS DEWEY served her country for 30 years, 8 months and 24 days, until decommissioned on 31 AUG 1990. The hulk of the DEWEY was scrapped in 1994. The second Dewey (DLG-14) was launched 30 November 1958 by Bath Iron Works Corp. Bath Maine; sponsored by Mrs. K. St. George United States Representative from New York State and commissioned 7 December 1959 Commander E. R. Zumwalt Jr. in command. Training operations off New England the Virginia Capes and in the Caribbean through the first 6 months of 1960 prepared Dewey for her significant role with the Atlantic Fleet.